Hey everyone, Ashley here! 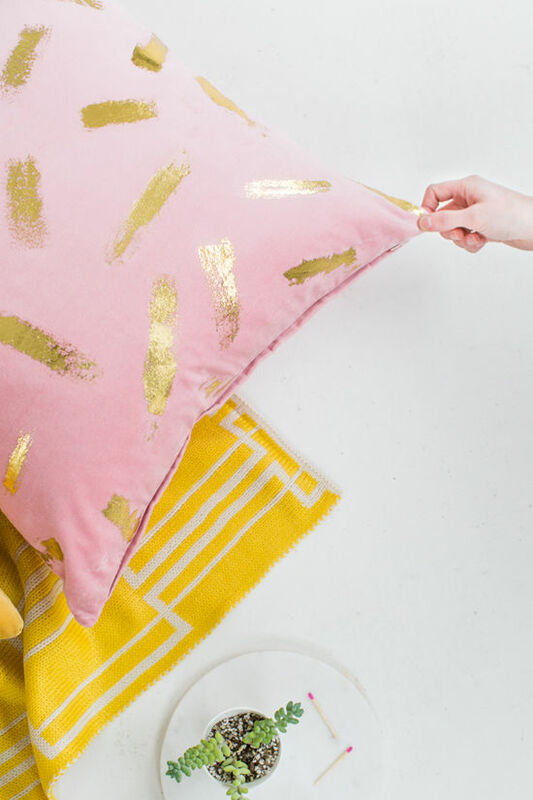 I’m super excited to share my love affair with all things gold with you today by showing you how to create this DIY gold foil brushstroke pillow. 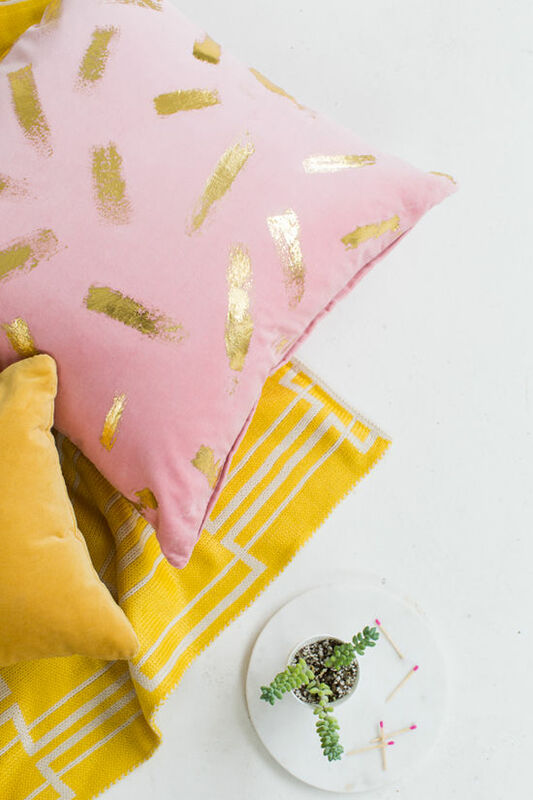 Don’t worry, it’s a very do-able weekend project that doesn’t require you to be super precise with a paint brush, plus you’d never know it’s a DIY. That’s a win/win folks! 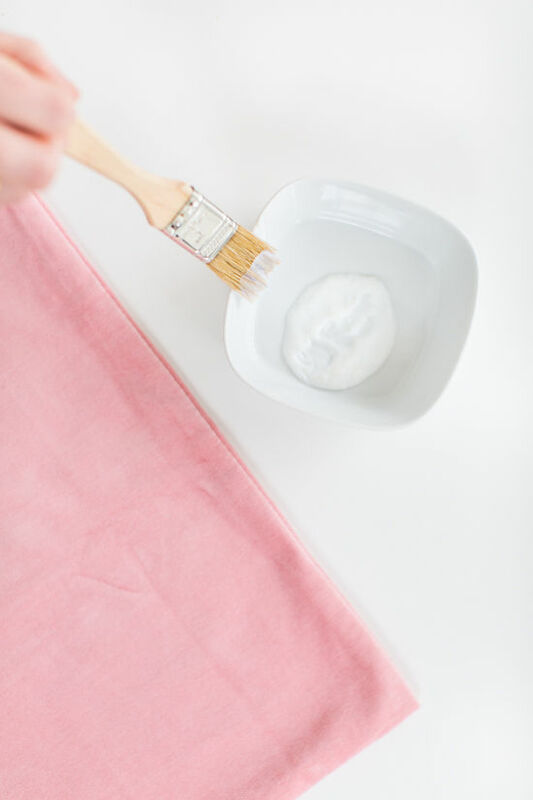 • Squeeze a bit of the silk screen adhesive into a small container to make brushing it onto the fabric easier. 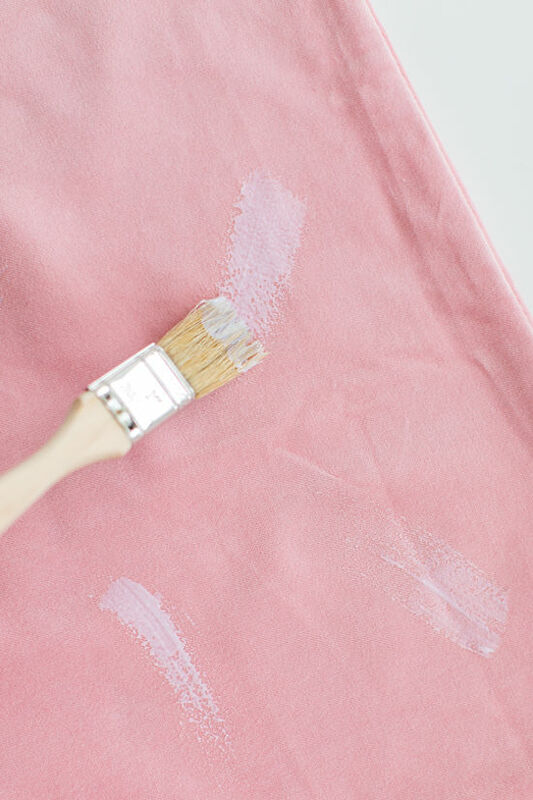 • Dip your brush into the silk screen adhesive and wipe away any excess paint (you won’t want too much excess on the fabric or it won’t adhere properly), then make a quick stroke onto the pillow surface and let dry for 30-45 seconds. • Next, place a piece of gold foil down onto the brushed adhesive spot (you can even use scissors to cut a small section just big enough to place on the glue to make it last longer) with the shiny/metallic side facing up. 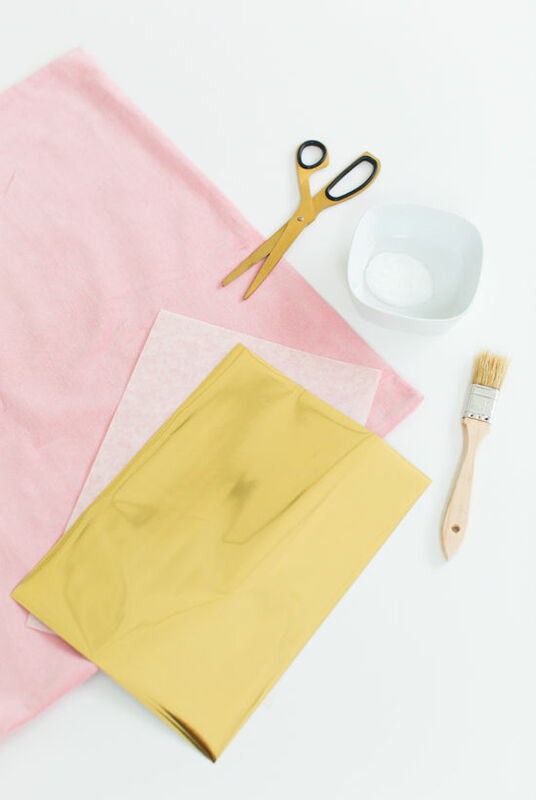 Place a piece of parchment paper down over top of the foil and apply heat with a household iron for 30 seconds or until to foil is evenly heated. Be sure not to overheat to foil it will burn the fabric and glue. 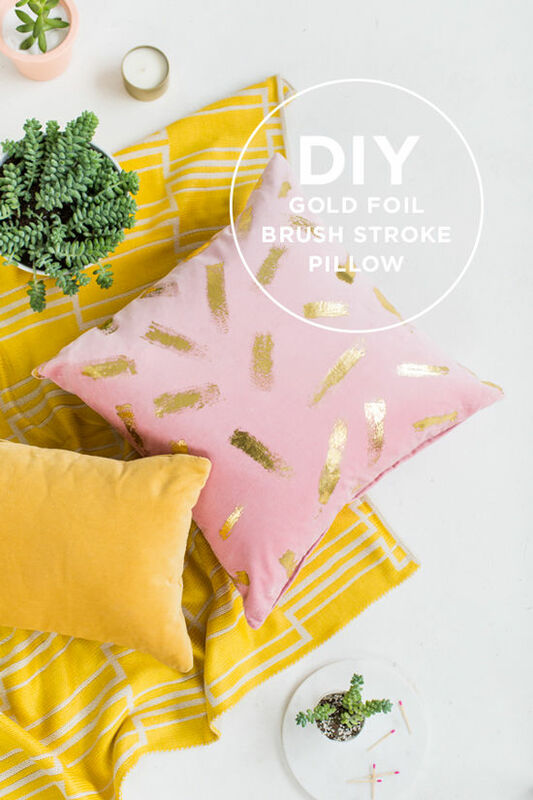 • Wait until the foil has completely cooled to the touch, then gently remove each piece of gold foil slowly and repeat the steps as necessary until your pillow is covered. • If you’re having trouble getting the foil to adhere, you’re either using too much adhesive or applying heat for too long. 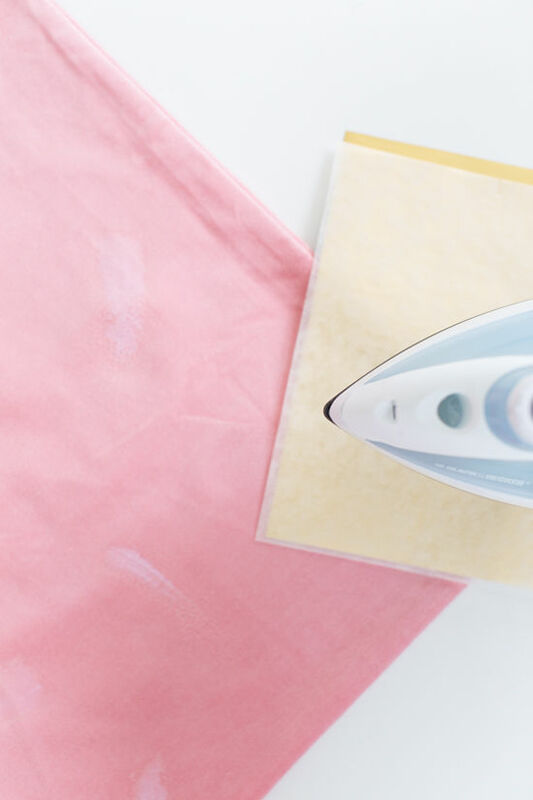 • Be very careful when printing onto velvet fabric that the iron doesn’t come into contact with the velvet, only the parchment paper or it will singe the texture. 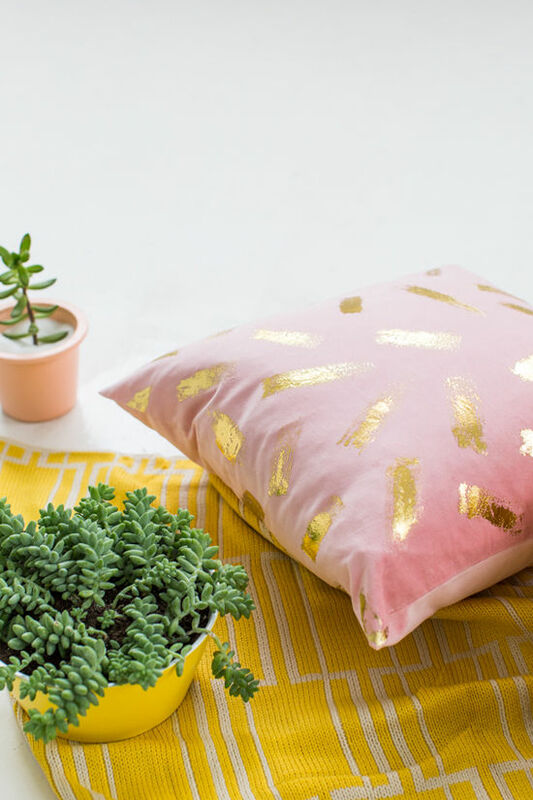 Once your pillow cover is complete, be sure to let the foil cure for at least 72 hours before major handling or hand-washing if necessary. I just love the pillow. I was looking for something in my craft room the other day and ran across some foils that I had forgotten about. All I need is the foil adhesive and I’m set. So it’ll be off to Hobby Lobby I go. Well, maybe when The sun comes up and it stops snowing. Happy New Year! This is so gorgeous!! I love metallic accents in decor lately. I would love it if you would provide a link to where you purchased the supplies, especially the foil and adhesive. That sort of info is always so useful. Who, I LOVE this DIY! I want to do it on more than a pillow! I never heard of silkscreen foil before, where do I get it?! I have to try it. I love the color combo of rich pink + gold! Looks simple and so chic. I love the color combo! Oh my goodness, this is adorable! This is ridiculously gorgeous! Who knew you could do this….problem is I will now need to do gold foil brush strokes everywhere….wonder how that will go down with my hubby?! This is an inspiring idea and really beatuiful project! You could get easily the same result with the New Gold paint of Autentico Paint. Have you ever tried to paint with it? love this Ashley! it looks simple to do too..pinned ! Yes! Where to find foil and adhesive supplies would be very helpful! Do you think I could do this on an area rug? Would the foil still adhere okay? Lovely piece of work. It looks gorgeous! I love gold foil and have been wanting work with it for a while. I will really want to do this! Great tutorial 🙂 Have a lovely day! I love this! It looks so artistic. It certainly looks a lot more complicated than it is. Whaaaaat??? This is crazy! I need gold silkscreen foil…. Love this project! any links to the supply list? I’m not sure why anyone would not try this – I definitely will! Great project! Where did you buy the paper and the glue? Oh my goodness this is so cute! I’d love to try this, but I’m having trouble finding the supplies. I’ve looked online and called around to art supply stores with no luck (what I found online looks totally different so I don’t know if it’s the right thing). Can you let us know where you go the foil and adhesive? I’d also love to know where you bought the supplies for this project! I want to try something similar and I was just today wondering how to do it, and then I found this post!! i have searched and can’t seem to find the supplies. Any ideas or links? Love this! Can’t wait to try something similar. Thanks for sharing! PLEASE post where you bought the supplies (gold foil and adhesive)! Please post where you got the supplies ive been searching for hours!!!!!! Still wondering where to find supplies! I found the supplies after some googling if anyone is still looking! What’s up colleagues, its wonderful paragraph on the topic of teachingand fully explained, keep it up all the time. This is absolutely beautiful and seems easy enough for someone who’s not very savvy with crafts. In bigger cities (I’m in LA) and there silk screening supply stores. I went to a super helpful place called McLogan in DTLA. The adhesive unfortunately doesn’t come in small amounts so it was about $30 but there are a TON of foil choices! marketing advises you place on your thanks web page. Lovely Diy, just wonder if the gold with flake off after some time.